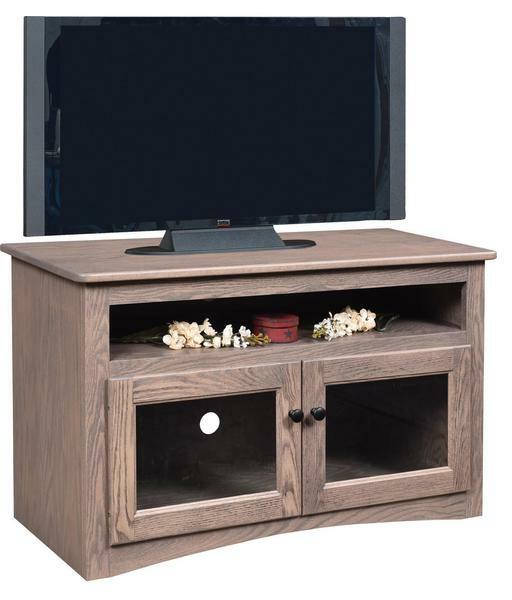 Our Amish Economy Flat Wall TV Stand is economical in price and style, but that doesn't mean it doesn't make a statement. Available in four different widths and two different heights, this contemporary unit with a clean design and rounded corners, can be made from a variety of wood, finish, and hardware options. All units feature doors and open cubby-like shelves with cord holes for easy access to outlets. What makes this flat wall stand so economical? Rather than the complete solid wood construction Amish furniture is known for, this piece is made with plywood sides. Don't let the word "plywood" deter you from considering this piece, though, as it won't ruin the integrity of the piece. You can learn more about plywood being used in solid wood furniture on our Timber to Table blog. Photo 1 of 8: 40"w x 17"d x 25"h. 2 flat glass-paned doors with no shelves behind, 1 open shelf above doors. Oak wood with FC-11343 Driftwood stain. Photo 2 of 8: 50"w x 17"d x 25"h. 2 doors with flat glass with no shelves behind, 2 open shelves above doors. Oak wood with FC-7136 Tanbark stain. Photo 3 of 8: 60"w x 17"d x 25"h. 2 solid wood raised panel doors and 1 flat glass door with no shelves behind. 2 open shelves above doors. Rustic Quarter Sawn White Oak with FC-7136 Tanbark stain. Photo 4 of 8: 70"w x 17"d x 25"h. 2 solid wood raised panel doors and 2 flat glass doors with no shelves. 2 open shelves above doors. Sap Cherry with OCS-117 Asbury. Photo 5 of 8: 40"w x 17"d x 30"h. 2 flat glass-paned doors one shelf behind, 1 open shelf above doors. Rustic Cherry Wood with OCS-113 Michael's Cherry stain. Photo 6 of 8: 50"w x 17"d x 30"h. 2 doors with flat glass with one shelf behind, 2 open shelves above doors. Rustic Cherry Wood with FC-11434 Driftwood stain. Photo 7 of 8: 60"w x 17"d x 30"h. 2 solid wood raised panel doors and 1 flat glass door with one shelf behind. 2 open shelves above doors. Top in Brown Maple with FC-7136 Tanbark, base in Brown Maple with OCS-230 Onyx. Photo 8 of 8: 70"w x 17"d x 30"h. 2 solid wood raised panel doors and 2 flat glass doors with one shelf behind. 2 open shelves above doors. Rustic Quarter Sawn White Oak with FC-7136 Tanbark. Shown in Oak FC-11434 Driftwood.